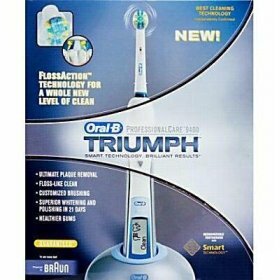 Dr. Michael Herringshaw and our staff are pleased to carry the Oral B Triumph Smart Guide ™ Toothbrush. Patients who use an electric toothbrush do have better check up results and an overall healthier smile! We want our patients to have the latest technology available in take home toothbrushes. If you are interested in ordering one to try today for $89 ($40 off regular price!) please call us directly at 586-573-4042 or email us directly with the number of toothbrushes desired and we will contact you at our earliest convenience. See for yourself what kind of results you can get before your next hygiene visit!